Vape pens are generally regarded as the simplest of vaping devices. The single piece battery assembly with built-in buttons ensures that you always get the results you seek. Vape pen batteries also come in a wide variety of colors and finishes, making them a fun addition to your vaping collection. From the Rocket 3 to the Pro series, pen-style vapes offer a great way to move from an older style e-cigarette into the more versatile vaping world and VaporFi has the pen-style batteries to get you there. For many vapers looking to upgrade from an entry-level e-cig, a vape pen is the next logical step. Although they do have a similar shape and size to a standard e-cig, vape pens are a cut above when it comes to customization options. One of these options comes in the form of features offered by the vape battery, which can change the way you utilize voltage, the heat of your vape pen, and more. 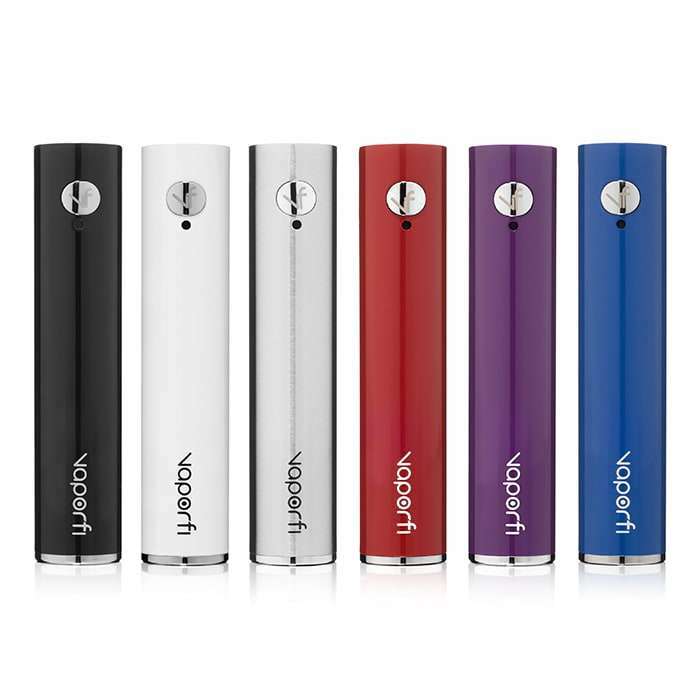 As with any vaping device, the vape pen battery is what turns it from a useless hunk of metal or plastic and into a functioning, vapor-producing device. Without a battery, you aren’t going to be having any vape sessions anytime soon. mAh refers to the milliamp hour rating, otherwise known as how long a specific battery can power your vape pen before it needs to be charged. In general, the higher the mAh rating is, the longer you can expect the battery to last. Higher mAh ratings also equate to increased efficiency. Common mAh ratings are 650 mAh (6 hours of vaping), 900 mAh (8 hours of vaping), 1100 mAh (10 hours of vaping), and 1300 mAh (12 hours of vaping). It is important to realize that the higher the mAh level of a battery, the larger it usually is. So, we suggest finding a happy medium between size and mAh rating to meet your vaping style. Amps are related to the level of electrical current that is supplied by a battery, with most vape heating chambers needing an amp rating of anywhere between 1 and 3. Voltage measures the amount of power that a battery can supply, with higher voltage batteries capable of heating the vape pen to a higher temperature. You need to check the minimum and maximum voltage of your specific vape pen to ensure you choose the correct battery. Threading has to do with the actual connector piece that screws the battery into the heating chamber, and it is critical to make sure you purchase a battery that matches the correct threading. Common threading types include 510, eGo, and iGo. If you really want a particular battery, but it has the wrong threading, you can buy a threading adapter. To provide your battery with a healthy, long life, it is essential that you charge it correctly. Don’t allow a fully charged battery to sit in the vaporizer charger, and do your best to charge the battery before it dies completely. When you purchase your vape pen battery, you want to look for options with convenient display lights, product warranties, and safety features such as overheating protection. If you are wanting to explore a calibrated vaping experience, you should look for a pen battery that has variable wattage and temperature control options. VaporFi currently offers two, top-of-the-line vape pen batteries that we have crafted in-house to be the best on the market. The Pro 3 battery is a 1000mAh option, with overheating and over-discharge protection available in a range of colors. We also recommend checking out the Rocket 3 battery, which offers temperature control and variable wattage with no configuration required. VaporFi is one of the few customer-focused vape businesses in the industry, and we are driven by our mission to make our customers’ vaping experience the best that it can be. Many of us are vapers just like you, and we know that you expect to receive quality products in return for your hard-earned cash. That’s why every single item in our inventory has been carefully selected for its incomparable quality, intelligent design, and distinctive features – there are no cheap knockoffs here. Our original VaporFi brand can hold its own with other top names in our selection, and it offers customers a competitively-priced, premium quality line of products that simply can’t be beat. Because we know that vaping can sometimes be an expensive hobby, we are always on the lookout for ways to save our customers money. Join our free loyalty rewards program, and your VaporFi brand purchase dollars will earn you points towards free vape juices, vaporizers, and accessories – who doesn't want free stuff?! Additionally, subscription services like our Blend of the Month Club can help you get discounts on a range of fun vaping products, making it more convenient to add them to your product stash. Finally, our customer service and 30-day money back guarantee set us apart as one of the most customer-centric companies out there. Call our support team anytime for any question, concern, or suggestion you may have, and we will be more than happy to chat. When you make VaporFi your exclusive source for all your vaping needs, you will be able to dramatically improve your vaping experience.